After landing in Zurich, a few of us had about four hours to kill while waiting for another co-worker's flight to arrive - so we decided to grab the rental van and drive around Zurich in order to get some fresh air and sunlight. 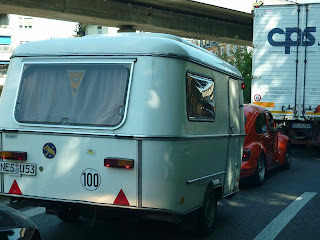 It was a pretty uneventful drive, but I did come across a vintage Beetle ("Kafer") towing a "caravan". It's not that uncommon around in Germany to see compact and mid-sized sedans towing what appear to be heavy trailers. SUVs are scarce and are generally of the compact variety while pickups are virtually non-existant. I did see a Hummer H3 on the streets of Cologne last night.This "mid-sized" SUV might have well been a giant H1 as far as the sense of scale is concerned. Oh, and the "100" circle tells the others on the road that this vehicle has a speed limit of 100 kph (62 MPH). No need to worry there.